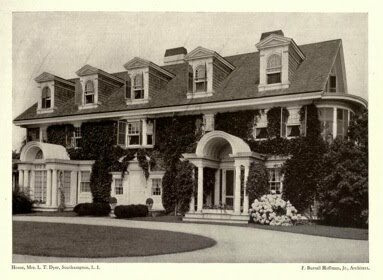 'Westlawn', originally built for Charles H. Lee by F. Burrall Hoffman Jr. c. 1900 in Southampton. A short while later the house was purchased by Edward Tiffany Dyer and his wife Edith La Bau, a grand-daughter of Cornelius Vanderbilt. 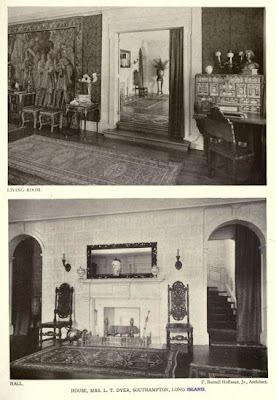 The house remains in private hands and appears to have undergone some renovations in the recent past. Click HERE to see 'Westlawn' on google earth and HERE on bing. I have always loved the shingled Hamptons houses with their shiny white trim. They seem so utterly appropriate to their place, that other materials and styles of architecture often strike an almost garrish note. Interesting to me to see that the architect clearly designed the interior in keeping with the exterior: relatively simple and straightforward- perfect for an oceanside resort. Then the owner or decorator hung the drawing room walls in what appears to be a dark silk damask,added a tapestry or two, a few oriental carpets and finished it off with portieres, just as if the commission was for a Park Avenue apartment. I find these strange juxtapositions perplexing, especially as you see them so often in houses of this vintage. Clearly it was the style of the times. 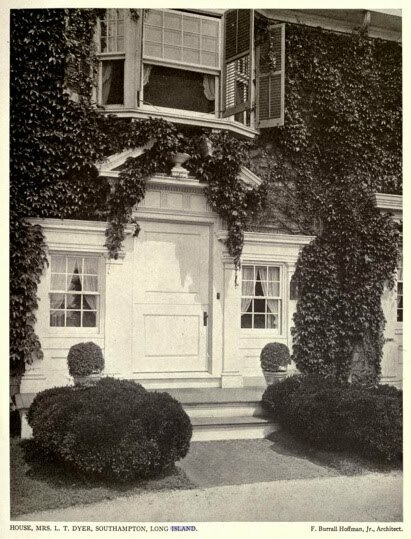 I wonder how many of the rooms we see are filled with cast-offs from the owner's parents or grandparents, or from other houses the owner may have had twenty or thirty years before. Verification word: glyago ... the villainous assistant principal on Glee. finally i am vindicated - welcome o flock of security word afficionados. i can't believe magnus didn't mention the real high point of this building - th e ivy.